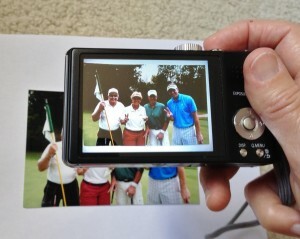 Taking photos of photos and documents can save you a tremendous amount of time and money. This technique is not about perfection, but it is about getting it done! Most people won’t be able to tell the difference if you learn to do this well. All you need is a digital camera, an iPhone or any smartphone that has a decent camera and of course the right lighting conditions and setup. I think natural light works best and a tripod can be quite helpful. For glossy photos it’s especially important to find an angle that doesn’t put any glare in the photo. We’ll soon be putting up a video and more tips on how to do this, but for now here is one method that I think works pretty well. You’ll need to be in a room with good natural light, but you’ll want to be far enough away from the window or door, that the light isn’t producing glare on the photo. Lay a piece of black or white papaer as the background. If I’m working on a bunch of similarly sized photos, I like to put removable two-sided Poster tape on the paper, so that I can stick the photos down if the edges are curled at all. Turn off the flash on your camera, as the flash will produce a white spot on your photo. Hold the camera directly over the photo and make sure it’s level. Take several shots from different distances above the photo. Cropping and rotating is something that can be handled on the computer, so don’t stress over aligning your shot with the edges of the photo. If you are using a smartphone, you can easily use the cropping tool in the Photos app. If you have a tripod that allows you to shoot straight down, it will make this much easier. if you use the self-timer feature on a short delay, you may avoid the shake that comes from pushing the button. Another option for smartphone users is an app call Photomyne. It’s particularly good for photos you don’t want to remove from albums. Check out our Photomyne review.